Many couples prefer the warmth of spring, summer or even early autumn for their wedding day, however at Bisou we happen to love a winter wedding celebration. Not only can the snow create the most breathtaking backdrop, there are also many perks to getting married in the winter. First of all, they're usually more budget-friendly since less brides are clamoring to marry during the colder months. Not to mention that guests most likely won't have to choose between your celebration and another wedding invite. But chief among them are the unique style details that work best for wintry nuptials! Here are a few cozy ideas that are a great way to transform your wedding into a winter wonderland without making your reception feel like a holiday party. The trick to making winter details feel formal and refined is to use them wisely and sparingly! Pick and choose the ideas that work best in your venue and don't feel required to transform every wedding detail into something seasonal. 1) Pine Cones- they are inexpensive, beautiful, and not to mention versatile! They are a great way to decorate a winter wedding! 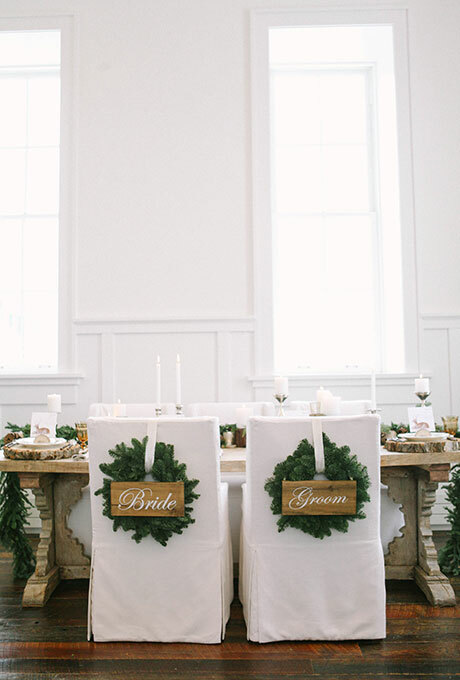 3) Evergreens- Whether you're using them to decorate your reception chairs or add color to your ceremony space, evergreen swags are the perfect winter accent. Add a handmade sign or bright berries for even more stylish look!